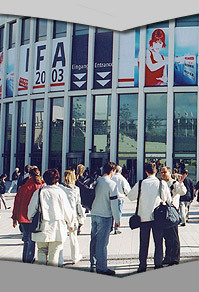 IFA 2005 - Digital Imaging & Digital Music - Posted by Dennis Hissink. 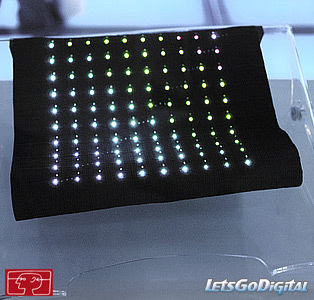 Philips demonstrates intelligent displays : At the IFA 2005, Philips is demonstrating photonic textiles; fabrics that contain lighting systems and can therefore serve as displays. With the development of this new and unusual technology, Philips Research is pointing the way toward a new age in the long history of textiles. At first glance, objects such as clothing, towels, upholstery, and drapes would seem unlikely places on which to place intelligent and interactive systems. Yet these low-tech objects figure prominently in our lives. By integrating flexible arrays of multicolored light-emitting diodes (LEDs) into fabrics, and doing so without compromising the softness of the cloth, Philips is bringing these inert objects to life. Flexible and Drapable - To meet the challenge of creating light-emitting cloth objects that retain their softness, Philips Research and textile institute TITV Greiz have developed an interconnecting substrate made entirely of cloth. Researchers from Philips have also created flexible and drapable substrates from plastics and films. 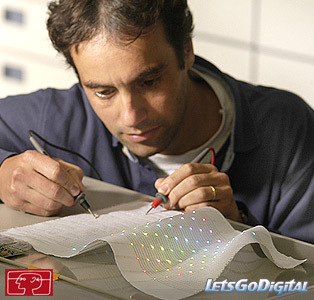 On these substrates, the researchers have placed passive matrices of compact RGB LED packages. The pixelated luminaires with relatively large distance between the RGB pixels have been embedded in such everyday objects as cushions, backpacks, and floor mats. Photonic textiles Interactivity - Since the fabric material covering the miniature light sources naturally diffuses light, each pixel seems bigger than it actually is. 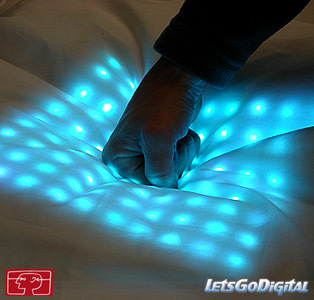 The LEDs, therefore, remain small and unobtrusive, while the fabric retains its soft look and feel. 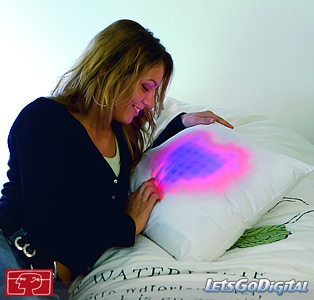 Photonic textiles can also be made interactive. Philips has achieved interactivity by incorporating sensors (such as orientation and pressure sensors) and communication devices (such as Bluetooth, GSM) into the fabric. IFA 2005 - Opportunity to get feedback - The results of these innovations are as various and promising as they are novel. Photonic textiles open up a wide range of applications in the fields of ambient lighting, communication, and personal health care. Photonic textiles are still a young business. Even at this early stage, however, Philips envisions partnerships with interior and apparel brands that see the potential of photonic textiles to revolutionize the very concept of fabric. The demonstration at IFA is also meant to show the opportunities offered by this technology and to gain customers' and visitors' feedback on these options.